Electrochemistry: The study of production of electricity from energy released during spontaneous chemical reactions, and the use of electrical energy to bring about non-spontaneous chemical transformations is called electrochemistry. Electrochemical Cell: A device which can use chemical energy to generate electrical energy, or can use electrical energy to cause chemical reaction is called electrochemical cell. There are two types of electrochemical cell, viz. galvanic cell and electrolytic cell. Galvanic Cell: The electrochemical cell which uses chemical energy to produce electrical energy is called galvanic cell or voltaic cell, e.g. Daniell Cell. Electrolytic Cell: The electrochemical cell which uses electrical energy to cause chemical reactions is called electrolytic cell. It has a zinc half cell and a copper half cell. The zinc half cell contains zinc sulphate solution, while the copper half cell contains copper sulphate solution; as electrolyte. A salt bridge connects both the half cells in order to complete the circuit. Cathode: The half cell in which reduction reaction takes place is called cathode. 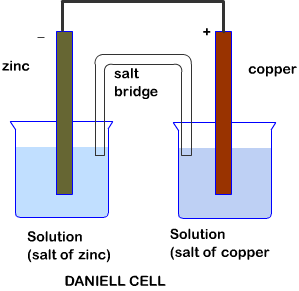 Anode: The half cell in which oxidation reaction takes place is called anode. The potential difference between the electrode and electrolyte is called electrode potential. At each electrode-electrolyte interface, there is tendency of metal ions (from the solution) to deposit on the metal electrode; trying to make it positively charged. Similarly, metal atoms of the electrode have a tendency to go into the solution as ions, and leave behind the electrons at the electrode; trying to make it negatively charged. When concentrations of all the species involved in half-cell is unity then the electrode potential is called standard electrode potential. Cell Potential: The potential difference between two electrodes of a galvanic cell is called cell potential. When no current is drawn through the cell, then cell potential is called electromotive force (emf). As per convention, emf of the cell is positive, and it is given by potential of the half cell on RHS (cathode) minus the potential of the half cell on LHS (anode). It is not possible to measure the potential of individual half cell. We can only measure the difference between the two half cell potentials. This measurement gives the emf of the cell. According to convention, a half cell called standard hydrogen electrode is assigned a zero potential at all temperatures corresponding to following reaction. Standard Hydrogen Electrode: It consists of a platinum electrode coated which is coated with platinum black. This electrode is dipped in acidic solution and pure hydrogen gas is bubbled through the solution. The concentration of both the reduced and oxidized forms of hydrogen is maintained at unity. This means that the pressure of hydrogen gas is 1 bar and concentration of hydrogen ion in the solution is 1 molar. At 298 K, the emf of the cell gives the reduction potential of the other half cell. This cell is constructed by taking standard hydrogen electrode as anode and the other half cell as cathode. If the concentrations of the oxidized and reduced forms of the species in the right hand half cell are unity, the cell potential is equal to standard electrode potential (`E_R^Θ`)of the given half cell. The measured emf of the cell (containing Cu as cathode) is 0.34 V which is also the value for the standard electrode potential of the half cell corresponding to following reaction. Similarly, the measured emf of the cell (containing Zn as cathode) is -0.76V which is also the value for standard electrode potential of the half cell corresponding to following reaction. The positive value of standard potential in the first case shows that Cu2+ ions het reduced more easily than H+ ions. The negative value in the second case shows that H+ ions can oxidise zinc (or zinc can reduce hydrogen ions).